The historic Cape Spear Lighthouse on the Avalon Peninsula in Saint John, Newfoundland has become a popular tourist attraction for people traveling along the Cape Spear Drive. 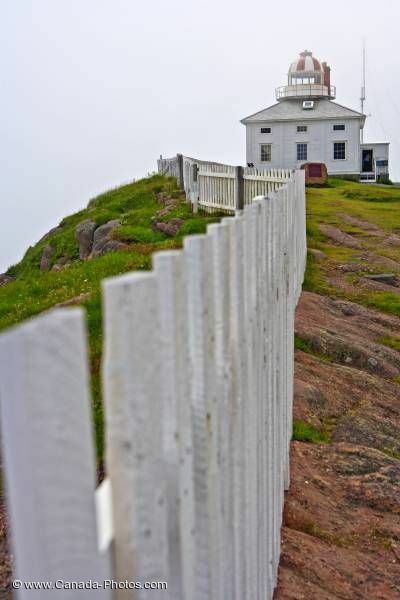 A white picket fence marks the border along the rocky cliffs where the Cape Spear Lighthouse overlooks the rough waters off the Avalon Peninsula near St John's, Newfoundland. This historic landmark is the oldest surviving lighthouse throughout Newfoundland, Canada and was declared as a National Historic Site. The first lighthouse was built in 1836 and was a square wooden building with a tower in the centre which housed the light. The second lighthouse built at Cape Spear was made of concrete and was completed in 1955. The original Cape Spear Lighthouse has been restored with all the furniture and decor once used by the lighthouse keepers. Picture of the historic Cape Spear Lighthouse on the Avalon Peninsula, Newfoundland. ... John, Newfoundland will stop to explore the historic Cape Spear Lighthouse and take in the scenery. The fog often lingers around this easterly point, but once it lifts, a spectacular view comes to light.